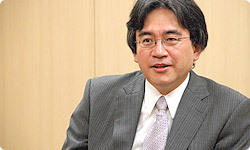 Hello, readers of Iwata Asks. This is Yasuhiro Nagata from “Hobo Nikkan Itoi Shinbun”, a website hosted by Shigesato Itoi. I’ve been editing this series of conversations. 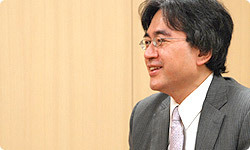 Earlier, when the Wii was released, I conducted a special edition interview of Iwata Asks, and I would like to do the same here once again. 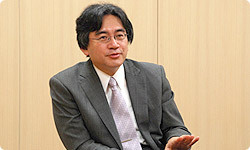 Of course, my interviewee will be Satoru Iwata, President of Nintendo. As with our first special edition interview, I took advantage of the atmosphere of this most special venue to shoot from the hip, as it were, asking questions of the sort you might not be able to ask in a normal interview or normal conversation. I was a little nervous, but excited in anticipation of how he might answer my questions. Enjoy the results! Yes. I’m looking forward to our conversation. As in our previous special edition, I hope you will allow me to ask some direct questions, without adhering strictly to any particular theme. First, I’d like to ask about something that struck me when I first heard the news about the Nintendo DSi. The timing was a little surprising. How did that come about? You mean to say it was sooner than you expected? Well, when we use a DS game console ourselves or when we see others using theirs, we always think about what might be done to allow more people to enjoy it. When we made Wii, our guiding motivation was finding a way to make it fun, and our actions seemed to hit home with users, so afterwards there was an intense interest in what would happen if we applied the same philosophy to the DS. So one factor for our timing was our desire as creators to try out our ideas. That’s why we made what we did when we did. Well, we’re presenting this as the third iteration in the Nintendo DS platform series. It isn’t a next-generation game console. It is merely a minor change. Basically, we have just picked out those areas where users wish the DS were different and made improvements. We increased the size of the LCD slightly, improved the audio, and slimmed it down because there was a strong desire out there for such changes. Maybe another reason the release seemed early to me is that it doesn’t really look like a “minor change.” You didn’t just make it slimmer and improve the sound, you added quite considerable new features such as the cameras and Nintendo DSi Shop, so it looks like a completely new piece of hardware. At root, it is still a DS. It isn’t completely new hardware. (laughs) I do think, however, that in order to ask our consumers to buy it, adding value they’ve never seen before, giving it novelty, is necessary. If all we had done was change the design a little, it would be hard to bring out. That’s why this time we added the cameras, SD memory card functionality and Nintendo DSi Shop feature, which allows users to download software. If those features stimulate the DS market and many people use their DS consoles more often, and add packaged software, our business opportunities will expand, and chances for new customers to play our games will increase. Certainly, however, the choice we have made does stray from the traditional platform release cycle. However, even though the current cycle – that is, a five year cycle when a piece of hardware is released, its price gradually falls, and its demand disappears – has been the standard, there is no need to say we must continue on with this cycle. In my personal opinion, when prices fall as time passes, it’s like manufacturers are saying to consumers that they should wait. I’ve always thought something was wrong with that. Of course, I don’t mean to rule out lowering prices no matter what happens, but I’ve always wanted to find a way to avoid disappointing those who try the hardest to support our newest products by purchasing them during the launch periods. I don’t want them to think it was a waste for them to do so. I see what you mean. As a consumer I resonate with what you just said. Next I’d like to ask about those features of the Nintendo DSi that show an evolution from earlier DS models. I think game consoles, cell phones and computers are rapidly approaching each other. Where do you see the boundaries between them? When it comes to our own platforms, we pay close attention to guaranteeing the performance of the integrated hardware and software, to similar methods of operation, and to the ability of everyone from children to older players to use them without reading a manual. Aside from software requiring peripheral equipment that uses the Game Boy Advance slot, DS software will work in any DS, and the manner in which you use each game doesn’t differ that greatly, so no one will be confused if they don’t pore over the manual. When it comes to those areas, I think there is a clear line between the DS and computers and cell phones. Even though the features and specs such as downloads and wireless capabilities have come to resemble each other so closely? Yes. Even though certain aspects overlap one another, such as being able to take pictures or listen to music, we don’t think the borders have started to disappear at all. It’s not so much about the features as it is about Nintendo’s philosophy in making them. What stance should we take? What should we ask from customers? What shouldn’t we ask from customers? We have not wavered whatsoever regarding those elements. Uh…I understand. I mean, the answer makes perfect sense. Let me rephrase my question for a little less wiggle room. Let’s see… Have you ever thought that as part of broadening the appeal of the DS, you should just give it a phone? Ha ha ha! Well, if our customers didn’t have to pay monthly fees, I wouldn’t mind. Right now, however, they would have to. That’s why the DS doesn’t have a phone. Um, I’d like to ask something else a little blunt. It’s more of a topic for discussion than a question, really. In the apartment building where I live, children face each other hunched over their DS consoles in the lobby. And children, especially boys, will take their DS consoles to parks and sit on the benches and play with them. Now that the capabilities of handheld game consoles have increased, children can even play video games outside. I’m not sure that’s entirely a good thing. In my neighborhood, for example, it’s almost only girls who can be seen riding unicycles or rollerblading. What do you think about that? Well, I’m happy if people play video games, but that doesn’t mean I’m hoping that other amusements will fall into disuse. I want children to play video games, but I also want them to experience other pastimes while they’re little. When I was a child I enjoyed all kinds of play, and I think that was a good experience. If video games dominate all other forms of amusement, then the market could take another downturn or be subjected to some form of regulation. Children, especially, are susceptible to anything fun. As a parent, I don’t think anything that absorbs a child’s interest is at all bad. While concentrating on something, they receive good stimuli, strengthening their inventiveness and creativity. But I want to remain aware of worries about being over-reliant on video games. That’s why Nintendo has vigorously encouraged person-to-person communication through its games. For example, with Wii, we designed it to show the amount of time you’ve spent playing. That was a challenge. Recording the amount of play time like that, players are likely to think, “I can’t believe I played so long!” For game makers, that can be a little scary. However, we thought someone should do that, so we did it with Wii. I don’t know how future generations will evaluate that experiment within the history of video games, but it’s one thing we did because we were convinced it served a beneficial purpose. I understand . I'm sorry I asked something so difficult to answer. I’m not sure if it’s alright to ask my next question…but, personally, you’re an Apple fan, right? Yes. It seems to be well known. Did that have any effect, even minor, on development of Wii or DS? I think Nintendo’s attitude in trying to fulfil its mission of creating entertainment that will be fun for anyone regardless of age, gender or experience shares a common element with Apple’s philosophy – or the set of values put forth by Steve Jobs – of making features as straightforward as possible, as easy to understand as possible, and as simple as possible because if there are too many options users will be confused. However, Apple is clearly a hi-tech company, whereas Nintendo is an entertainment company, so the ways we order our priorities are quite different. For example, we won’t hesitate to choose making something more durable over making it 0.5 millimeters thinner. By contrast, I don’t think Apple needs to perform repeated endurance tests dropping iPods from the exact height of a bicycle basket. If Apple and Nintendo have a similarity, I think it is enhancing appeal through simplicity. When you really pursue something, it rapidly gets simpler. But I do think there are differences between us. Because our priorities are different. Thanks. For some reason, I’m glad to hear you say that. Is there anything you feel you may have forgotten to mention regarding the Nintendo DSi? Yes. I often wonder what this console means to me. As I’ve watched the DS increase in popularity, I’ve been rewarded to see it embraced by the types of people that at first I never imagined would. But I’ve also seen challenges. 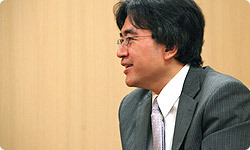 I’ve heard complaints – some not entirely bad, such as about having to lug around a bunch of game cartridges, for example – and noticed that, even though we have changed the nature of gaming with the DS, the DS hitherto has represented the same old concept centered around plugging in a single game cartridge. Also, sometimes when using my cell phone, I’ve thought that adapting this or that service to the DS would make it much more convenient. And, above all, I’ve thought about what should be done so the DS platform will remain vibrant years down the road. But I wonder if perhaps the DSi solves all these problems by allowing users to tailor their own unit and walk around with their personalised DSi. Shigeru Miyamoto once said that a true idea is “something which solves multiple issues at once.” The Nintendo DSi has in one stroke solved all the challenges in the DS market that we have had our eye on all these years. I feel like we can maintain this healthy state. Looked at like that, the DSi is a truly good idea. Thank you for that candid answer. By the way, why is it called the Nintendo DSi? For Wii, “i” represented the people who gather to play with Wii as well as the Wii Remote itself. I’m sure those who remember the animated logo used when we announced the name of Wii understand that. The “i” in Nintendo DSi represents people just as it did for Wii. As many people are already aware, Wii also suggested the plural pronoun “We,” so there is more than one “i.” It expresses our desire that people gather in groups around their Wii. So, in short, we gave it this name to make it more personal and to emphasise its new “eyes.” To me, in consideration of everything that we’ve done starting with Wii, it’s a very natural name. I’m extremely anxious to see how the rest of the world will take it. Even though you can analyse it objectively, you still feel anxious. It’s always that way whenever we release something. It was that way with the DS and with Wii as well. So at this point would you say you feel proud that the moves you’ve made weren’t a mistake, or that, you “won,” as it were? No, I just feel lucky. It was pure luck that Brain Age was completed with such good timing, that we were able to notice it was becoming successful, and that those circumstances led to the DS finding a wider market. 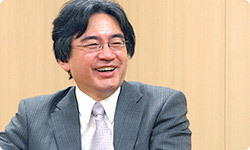 Everything from Miyamoto-san’s obsession for realising Miis and the Mii Channel to the favourable worldwide reception of Wii Sports to the acceptance of stepping on a set of bathroom scales as a pastime couldn’t have happened without luck. You could say we’ve experienced unusually good luck. Well, one thing I can say with some pride, however, is that everyone at Nintendo puts forth an immense amount of effort, which invites good fortune. There are lots of cases around the world, however, in which people put forth the same amount of effort but don’t meet with success because luck hasn’t favoured them. But if all your successes so far are merely due to luck, aren’t you scared about what might happen when you take your next step?